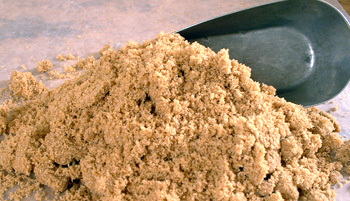 Brown Sugar is processed, refined white sugar, cane or beet, that has been thinly coated with molasses. It is moist and clingy because the molasses film on its white sugar crystals has about 35 times more water in it than in white sugar on its own. When left exposed to air to dry, all this moisture evaporates and becomes rock hard. When resoftened with a piece of dried apple or a Brown Sugar Mouse in the jar, it will go back to as it was. The molasses used for Brown Sugar is always derived from sugar cane molasses, as no satisfactory way has yet been found of making molasses from sugar beets. You can get light (aka golden) Brown Sugar, and Dark Brown Sugar. Some people think that because Brown Sugar looks less processed it is more healthy. But it is very processed, and all you get are the trace nutritional elements in molasses, which are negligible to begin with. Store in a sealed container with a Brown Sugar Mouse or a piece of dried fruit such as apple in it. If your Brown Sugar goes rock hard, zap for 10 to 20 seconds in the microwave.